The first time I was eligible to vote was the referendum on the Good Friday Agreement. My friends and I were hugely enthusiastic about it. I got up at the crack of dawn to be the first one at the polling station. I was not alone - there were many people my age, first-time voters. Looking back, voting itself was a fairly underwhelming experience. I felt slightly cheated that the whole process took less than a minute. But I was never in any doubt about the transformative significance of the peace process and the agreement we endorsed. Growing up in the North, there was a certain inevitability about violence and discord. Young people left in their droves and those who stayed kept their heads down. We idolised people like John Hume, but I don't think anyone ever thought that the guns would fall silent. Then, to paraphrase Seamus Heaney, hope and history seemed to rhyme. The current political quagmire is depressing. But the North is a different country. Belfast is booming and people are increasingly optimistic. Even without political institutions, Northern Ireland is enjoying the peace dividend, and friendships across the divide - once a taboo - are now thankfully commonplace. That hand of friendship reaches across the Border now too. Many Northern Protestants now feel as comfortable with a day trip to Dublin as they do to Portrush. 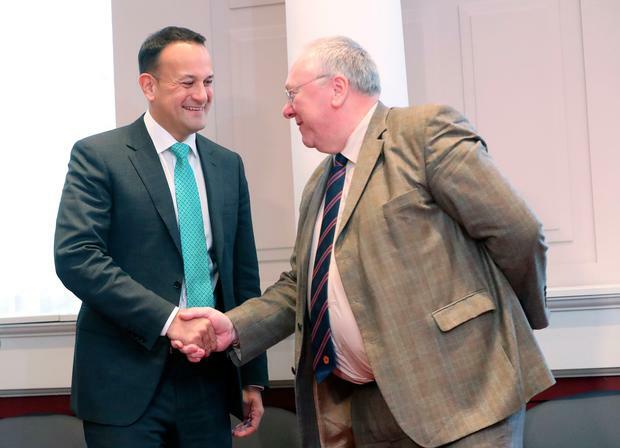 Ian Paisley might have thrown snowballs at then-Taoiseach Jack Lynch in the 1960s, but the sight of the leaders of the Orange Order in Dublin on Monday for a meeting with Leo Varadkar barely raised an eyebrow. No longer do unionist communities moan about 'interference' from Dublin, they actively welcome funding from the Department of Foreign Affairs for community projects. Evidently the meeting between the Taoiseach and the Orange Order was a pleasant affair. A statement released afterwards quoted Mr Varadkar saying the meeting was an opportunity to build bridges. "I strongly believe that states can best be judged on how they treat minorities. This visit today is another step in an ongoing engagement between the Government and the order. We must always keep channels of communication open as a basis for respectful discussion on matters of common interest," he said. Wise words - and dialogue is surely key. It's not for nothing that the colours of the national flag are white, green and orange in equal measure. But we also need to ensure that the dialogue is not simply a one-way street. There have been attempts in recent years to rebrand July 12 as a carnival rather than a triumphalist commemoration of a battle more than 300 years ago. The Orange Order has been at pains to point out that Catholics should not feel threatened. Yet year after year images representative of the Catholic and nationalist community are burned on bonfires celebrating William of Orange's victory over James II at the Battle of the Boyne. A few years ago, a statue of the Virgin Mary was rescued from a pyre just before it was set alight. Last year, an effigy of the late deputy first minister Martin McGuinness was burned on a bonfire in east Belfast. Now the Orange Order hierarchy might protest with some justification that it can't be responsible for the actions of all of its members and followers. That might ring true if it were not for the fact that Orange bands regularly indulge in sectarian actions outside Catholic churches across the North. The truth is that there are deep and abiding seeds of sectarianism within the Orange Order. Before you think I'm being overly sensitive, ask the former head of the Presbyterian Church in Ireland. Rev Ken Newell said last year "there is a reservoir of anti-Catholicism and sectarianism" among the order's members. As a former chaplain to the order, one might say he knows of which he speaks. While this was furiously denied by the order, the fact remains that under the rules of the organisation, it is strictly forbidden for Orangemen to marry Catholics. In 2011, Ronan Kerr - a 25-year-old Catholic policeman - was murdered in my home town Omagh by dissident republicans. His funeral a few days later was an occasion when the community game together to support his grieving family. The then-unionist MP for Fermanagh and South Tyrone Tom Elliott fell foul of the Orange Order of which he was a member because attendance at liturgies in Catholic churches is also forbidden. In the end, likely to avoid negative publicity, no action was taken - but the rule remains. Orangemen recently boycotted an ecumenical service to commemorate Irishmen who died in World War I because of the presence of a Catholic priest. Mr Varadkar is right that dialogue is key. But he must not fall into the trap of allowing that dialogue to be a one-way street. Sectarianism should be called out for what it is, and the Orange Order has deeply engrained sectarian attitudes and rules. Following the Good Friday Agreement, the GAA rightly came under pressure to lift a ban on 'crown forces' playing Gaelic games. There's more than one way to be Irish, and serving in the police service in the North is a noble vocation for Gaels. The GAA rose to the challenge and there is now a recognised PSNI GAA club. The Taoiseach should continue to meet with the Orange Order, but he should also put pressure on it and remind it that sectarian bans go against the values of this Republic. On the issue of Brexit, the DUP is trying to ignore the wishes of the people of the North and go it alone. It is being rightly challenged on this and reminded that the only credible pathway for the North is a shared future. Our political leaders should put the same message before the Orange Order and remind it that time is up on sectarianism.